Porting has just been completed and service with AT&T has been discontinued, I now want to distribute ooma dial tone to all jacks in the house. In the knowledge base it states "Your landline (connection to the Central Office) is disconnected" since this is now done can I connect Ooma directly to the phone jack or do I need to cut the lines coming into the house? It states "This advanced setup requires disconnecting your home phone wiring from your telephone company before connecting it to Ooma Telo"
I don't want to damage my base unit but I do want the dial tone to all jacks. You said in your post that your service with ATT has been disconnected - so as I answer your post I will be assuming that you have cable for your Internet - NOT DSL. If this is not the case, let me know because I will need to modify the instructions so you don't lose your Internet. There is a little box on the outside of your home - it may be either fairly small, about 6" x 4" or somewhat larger. The instructions are the same. That box is the Network Interface Box or demarcation box. There are two sections - one for access only by the telco, the other for customer access. Open the side for customer access (it may require removing a screw) and you will find one or more little cables plugged into the back part of the box. Merely disconnect these modular plugs from the jacks. 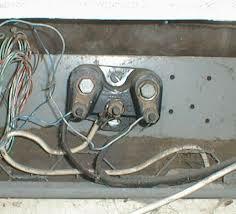 This will isolate your home wiring from the telco. Now, just to be safe, place a note that says, "Do not reconnect telco wiring. Doing so will damage customer equipment!" Now you can take a modular (phone) cord and run it from the ooma's PHONE port to the jack on your wall. That should bring ooma dialtone to every jack in the house. If you want to also use a cordless base or phone next to the ooma, purchase a one-line splitter at the dollar store or Radio Shack and use it to split the wiring at either the ooma or at the wall. Here is a picture of the little jacks in the NIB. 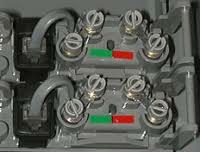 Note that some of the newer boxes use a hinged plug instead of the cable. Just swing the plug out of the way. I had Verizon DSL+phone. Before I started the porting process, I requested Verizon to separate my DSL and phone bill, so that they can charge my credit card for DSL. (this way when my number is eventually ported, I still have DSL with Verizon so that my Ooma works). Then initiated the phone number porting from Verizon to Ooma. Today I had my number porting completed from Verizon to Ooma and received email confirmation from Ooma about successful number porting. Ooma's email mentions that I can now call old carrier to cancel my phone service with them. Isn't number porting automatically going to cancel my phone service from Verizon (old provider)? How do I get Ooma dial tone on all my phones connected to wall jacks? Verizon DSL (dry loop I believe as phone number now ported to Ooma). Downstairs Wall telephone Jack has a 2 line splitter. One line goes to Verizon Integrated Modem-Router (has 4 Lan ports E1,E2,E3,E4), and the other line from splitter connected to a telephone (TV1). Ethernet cable from Verizon Integrated Modem-Router port E1/uplink connects to Ooma Hub Modem port. Ooma Hub phone port has a separate telephone (TO2) plugged in. Other wall telephone jacks are in the house (kitchen, bedrooms etc.) have other telephones (TV3,TV4,TV5...) plugged into their respective wall jacks. Telephone TV1, TV3, TV4, TV5 etc. was old Verizon phone line now ported to Ooma. I hear the Ooma dial-tone on TO2. (the phone directly plugged into Ooma Hub). I can still hear different dial tone on TV1, TV3, TV4, TV5 etc. I can make outbound calls from all the phones. (TV1, TV3, TV4, TV5 etc. and TO2 as well). When I receive inbound calls, only the phone TO2 (connected directly to Ooma Hub) rings and can answer. I would like to get Ooma dial tone on all my phones so that I can make/receive inbound/outbound calls from all phones. I'm in the same situation as the original poster. However, I don't have an NID as pictured. 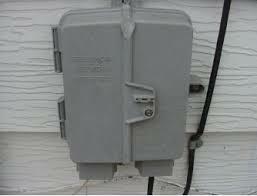 Instead I have the old style one called a "protector", since my house was built in 1968 and At&t never installed a newer NID. What are the steps to disconnect the wires coming in from the phone company? I'm using cable internet for Ooma. No problem here as all you need to do is disconnect all of the red wires from one side (it will be a brass stud with brass washers and a brass nut) and connect them together and disconnect all of the green wires from the other side and connect them together - separately from the red ones. The black heavy wire (probably in a substantial coating for either overhead or direct burial goes to the telco and you can leave it attached to the "protector". If you have any newer wires connected to the "protector" they will be white/blue - just connect them up with the red and green wires as they were before. If you have black and yellow wires of the same type as the red and green, they are probably just wrapped around the cable. You can leave them as is. I prefer either "beanies" or scotchlock connectors to join the red wires and the green wires. The important think is to keep them well insulated and free from moisture. The connectors I mentioned have a silicone gel that does that. you can buy them from Home Depot or Lowes. The pictures below are of the newer and older "protectors". Left Post - black (connected to thick black bundle), green, red w/blue stripe. Right Post - red, green (connected to thick black bundle), blue w/red stripe. Actually it is just two of the ones in the left picture inside a stucco ring. The top one is used in your box, the lower one is not. You didn't mention if you had an alarm system - if you do let me know and we can walk you through some additional steps to make it work. If not, (or if the house has one that has been abandoned) the notes below should work. Normally the feed from the street would be red and green - but something is a little bit wierd with your wiring and that is why I suspect an alarm system. Also, it may be that they juryrigged a second line using only one protector - if that is the case, let me know because some of the info below will need to be changed. The black (connected to thick black bundle) is your telco feed. You can leave it on the protector but take the green and red w/blue stripe off and connect them together using a scotchlock or similar connector. Right Post - green (connected to thick black bundle), red, blue w/red stripe. The green (connected to thick black bundle) is your telco feed. You can leave it on the protector but take the red, blue w/red stripe off and connect them together using a scotchlock or similar connector. line 2: orange w/white stripes, white w/orange stripes This is typical for newer construction. You won't need this pair now but it might come in handy in the future. The previous owner had an alarm hooked up. But the alarm is inactive and I'm not using it. ...but when I Do so, it disables my Hub. I can no longer make calls and the Tab turns red.